We are very proud to announce the release of LiteMage Cache. This new Magento extension easily integrates Magento stores with LiteSpeed Web Server’s superior ESI support — delivering the world’s most powerful Magento caching. Page caching is the most powerful way to bypass Magento’s heavy architecture and speed up slow pages, but Magento pages are notoriously hard to cache because they contain little blocks of information (like the shopping cart) that cannot be shared between multiple users. LiteMage Cache uses Edge Side Includes (ESI) to punch holes in pages where information changes from visitor to visitor. The remaining content is saved to cache. When the next person visits the same page, the cached content is served quickly, with only the holes needing to be filled in with data for that visitor. LiteMage Cache also caches per-user data in private caches, so entire pages, even those with multiple holes, can be assembled completely from cache. 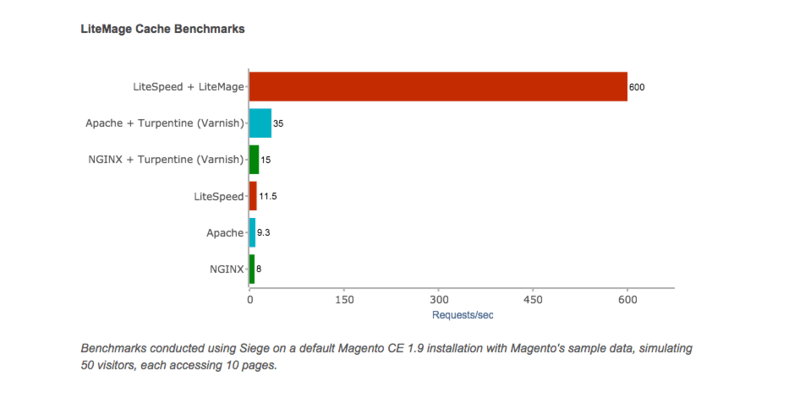 With LiteMage, Magento users can greatly increase the amount of content served from cache, resulting in much faster pages and less resource usage. All content can be assembled from cache, even per-user, private blocks, for best performance. Multiple blocks are called for in a single request, lowering overhead. Supremely scalable — handles 10,000’s of connections without missing a beat. Built-in extra anti-DDoS features protect you from attacks. Edge Side Include (ESI) engine for hole punching. Punched holes are configurable and mapped to blocks defined in Magento page layout. Main page and public blocks are cached once and served to all users. Private blocks are cached per-user and served only to that user. Retrieve multiple blocks in one request, minimizing the overhead of building pages with multiple blocks. Supports layered navigation, category filtering, view as, sort by and show per page functionality. Supports multi-store, multi-currency, and multi-user groups. Built-in crawler to warm up cache. A more detailed breakdown of the issues LiteMage addresses and the advantages of LiteMage can be found on our LiteMage Cache page. Installation and configuration instructions can be found in the LiteMage installation manual on our wiki. Prepare For the Holidays With LiteMage’s Newest Feature: Site Visitor Acceleration! 600 requests/sec, it’s unbelievably fast. After seeing this I need to give litespeed a try.